Open Easter Sunday for Brunch! 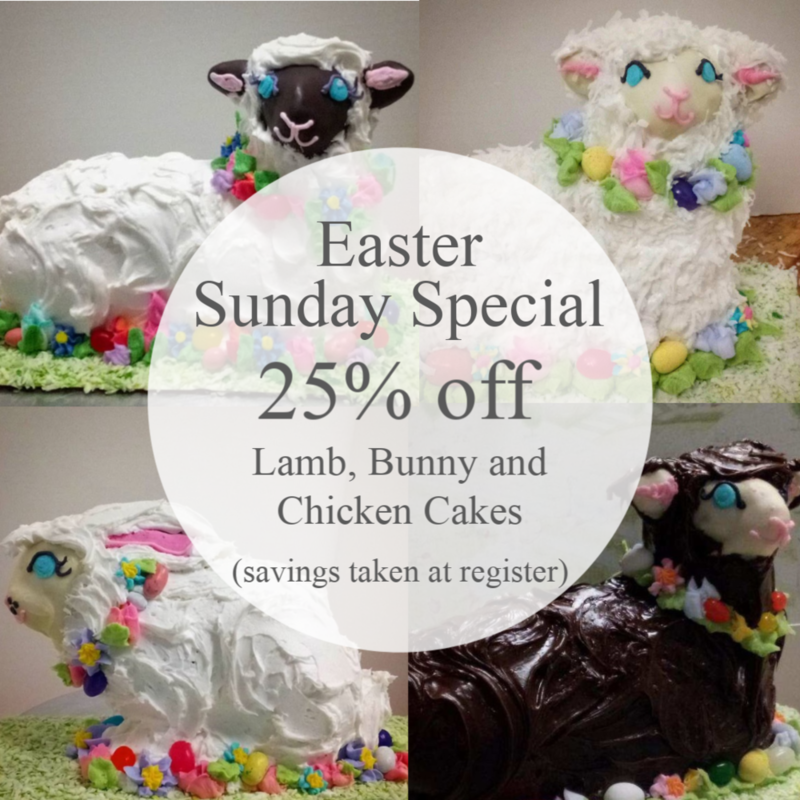 And 25% off Lamb, Bunny and Chicken Cakes! Food and Drink specials running all month long! We were privileged to recently have an article written in Life & Style Magazine about one of our favorite things—our decorated sugar cookies! Click HERE to be taken to the article, where you can read more about the iconic cookies and how they can be customized for any event! And did you know, we can ship pink cookies? If you are like us and sometimes just need to get your hands on the nostalgic, classic sugar cookie, give us a call at (618) 529-4303 and we can send them to your town. And if you’re local, CarGo can bring pink cookies to your door during our business hours! Click HERE to download their app! We have a lot of holiday happenings this year! Make sure you scroll down to find about our freshly made treats, meals, gifts, events and activities to help make this holiday season festive, fun and yummy! Holiday baked goods, dinners and more! If you are looking for a special gift or something to bring to a gathering, we make seasonal cookie and pastry trays that are perfect for parties, thank-you presents, and other festive occasions. We take orders for Turkey Dinners all the way until December 21st! If you’re having a party, let us do the cooking! Just give us a call at (618)529-4303 to place an order. Click the button for a menu of our other holiday specialties. Hanukkah is here, and we have a variety of fun cards and yummy decorated cookies in stock for the holiday! Our Buche de Noel (Yule Log Cake) is made of chocolate cake rolled with regular or mocha butterfluff, covered with chocolate ganache, and decorated with homemade meringue mushrooms. It makes both a great treat and centerpiece! Live music after the auction! Refreshments served and libations available for purchase! If you have items you would like to sell in our auction, e-mail us at cristaudoscafe@gmail.com. Items will be posted and online bidding accepted ahead of the auction on our facebook event. For more details about this unique event, click on the button below. We have a number of options for family members to get in on the cookie decorating fun! We are hosting our gingerbread house decorating event on Dec. 22, and we are making to order: gingerbread house kits in two sizes, decorated gingerbread houses in two sizes, and paint-it-yourself cookie kits. Click the button and check out the menu of options! Back by popular demand: Our Gingerbread House Decorating Event on December 22nd. We provide the homemade assembled house, you provide the creativity! $35/person includes one house, supplies, mentoring, coffee, cocoa and cookies. Additional decorators for $6.00 per person. Cash bar will be open. Space is limited, so check out the flyer below and call us at (618)529-4303 to reserve your spot! We are making paint-it yourself sugar cookie kits again this year. Our set of iced sugar cookies come packaged with edible "paint", a paintbrush, and instructions. Thanksgiving needs? We got you covered! Give us a call at (618) 529-4303 to place your order! We don't just bake for the holidays either. We make Turkey Dinners with all the fixins too! You can order your Turkey, Gravy, Mashed Potatoes, Corn O'Brian, Green Beans Almondine, Orange-Cranberry Sauce, Sage Dressing and more, and pick it up hot or cold, ready to go! We are taking orders through Monday, Nov. 19th! Tim Crosby and the Lightning Strikes will be performing live at Cristaudo's with Matt Garrison! Tim Crosby is a southern Illinois-based songwriter and performer in the Americana/country rock genre. He released a CD titled "Resurrection Mule Farm" with his band, the Lightning Strikes, in 2017 and currently is recording another CD. He performs more than 100 shows a year, including nearly every weekend at venues in Illinois, Missouri and Kentucky, playing all original music that explores the trials and triumphs of everyday people. His influences include Steve Earle, Tom Petty, Todd Snider, John Prine, Chris Knight and others. Tim is joined by James Ricks on bass and Daniel Tejada on guitar. Matt Garrison kicks off the night at 7:30. The Unveiling of our Cabinet of Curiosities!! A performance to introduce to you our prized possessions of the odd, curious, strange and mysterious and the stories of how they came to be. Tarot readings from Madam Zoltar through out the evening. Refreshments and drinks served, cash bar will be open! $5 At the door or $8 for a wristband to get into this event and Skihaus of Horrors. All of the remaining work is currently available through online auction. The entire collection will be hanging in the store and for sale online through the end of September. 10% of all proceeds from sales will go to benefit The Women’s Center of Carbondale who provide comprehensive services for survivors of sexual assault and domestic violence. If you didn't already know, Cristaudo's is having shows. Come check out this one! It's an early show, SO COME EARLY. Lauren Diaz Young is a local artist and abstract painter. Pop in to Cristaudo's between August 6th and September 2nd to see her recent works. This is an early show! I repeat this is an early show! Please come early! We are excited to host the sale of the Lorenzo Cristaudo Collection of renowned artist Herbert L. Fink (1921-2006), first Distinguished University Professor of SIUC. The works offered include Herb’s original ink drawings used for etchings, original ink wash and watercolor studies, and signed and numbered prints. Nearly three dozen posters from Mr. Fink’s shows round out the offerings. All the prints and drawings are accompanied with a certificate of authenticity. Lorenzo Cristaudo will be present at the show's opening reception on September 8 from 6-8 PM. The works will be for sale in person at the reception and will be available in online auction starting September 9th. 10% of the proceeds go to support the Women’s Center of Carbondale. Another night of music for you fine folks! "A Hare. A Sandworm. A Bottomfeeder. A Red Leg. From the deepest reaches of the South side, Harvey McLaughlin's trick bag of mysterious sounds stretches throughout the dimensions of folk, punk, r&b, honky tonk, soul, garage rock, surf, and the blues." With local support from Topple and Space Fossils!! Art is available for purchase. Check out great art hanging at Cristaudo's now through August 5th. Father's Day is right around the corner! We have cookies, sweets, cards and gifts for your favorite father figure! Don't forget to treat him on his special day! Order ahead for your 4th of July festivities! We make hamburger and hot dog buns, pasta and potato salads, holiday cookies, we cater, and more! Call us at (618) 529-4303 to reserve our food for your event! PS. We will be closed on the 4th to celebrate with friends and family. Light eats and alcoholic beverages available for purchase. $5 suggested donation. The Minks are a bluesy psychedelic explosion from Nashville, TN. "Psychedelic bloos for an easy mind in these hard times...Let's Boogie!" https://theminksss.bandcamp.com. Music provided by Alexandra Bolus. Light refreshments will be available as well as a cash bar. Midwest Dirt will run from June 5 - June 29. Stop by during regular hours to see the show. Nathan Pearce is a photographer and book and zine maker based in Southern Illinois. His work has been exhibited nationally and internationally. "This project is about a time in my life when I can feel the tension between home and away." Starting on June 3rd Carbondale will have a new Sunday brunch spot! We’ll be open for breakfast and lunch from 10-2 with bar service starting at 11. Come and join us! We are excited to host our 5th Annual Mother's Day Brunch! Reservation Only, call (618) 529-4303 to reserve your spot! Adult Beverages available for purchase upon request after 11:00am. Live Auction featuring vintage and local art, curios, knick-knacks, and all things curious, kitschy, fun, interesting or down right beautiful. Auction followed up with live music by Kompresso and other musical acts, TBA. Doors open at 6:00, event starts at 6:30. Call (618) 529-4303 for more info! Photographs, drawings, paintings and collaborative works by Ty and Belinda Shults are on display and for sale. Come and get to know the artists on May 25th, and and ask them about their work! Did you forget to feed the meter while shopping downtown and now you have a ticket? If so, we're here for you. Trust us, we know how much of a bummer a parking ticket can be, so we are now offering a 10% discount off of breakfast and lunch within a month of receipt of your ticket. It is still cheaper to pay for parking, but for those days when you overstay your minutes, we have your back.